This entry was posted on March 7, 2012 at 12:23 pm and is filed under FILM, literature with tags Charlton Heston, Jacques Tati, Max Ophuls, Pirates of the Caribbean, Richard Lester, Robin and Marian, Ronnie Barker, Ted Elliott, Terry Rossio, The Four Musketeers, The Three Musketeers. You can follow any responses to this entry through the RSS 2.0 feed. You can leave a response, or trackback from your own site. So glad to see a rave for the glorious MUSKETEER films! One of the formative experiences of my youth…so much so that I can hardly bare to watch any other version, even though the Gene Kelly/Lana Turner film from 1948 is actually quite good. A small part of me still hasn’t recovered from the end of THE FOUR MUSKETEERS, when Faye Dunaway (as the evil Milady) strangled Raquel Welch (as the sweet but clueless Constance) with a big clunky necklace. I was truly devastated by this at the age of 10. It was up there with the end of NICHOLAS AND ALEXANDRA, when the lovely Imperial family got gunned down by the evil Bolseheviks. Oh well, at least the MUSKETEERS didn’t warp my political views for life! I think the “big clunky necklace” is a rosary! The blasphemy is mirrored when Michael York skewers Christopher Lee against a bible and lectern. Lester is a free-thinker, but this is still fairly bold for a kids’ film. 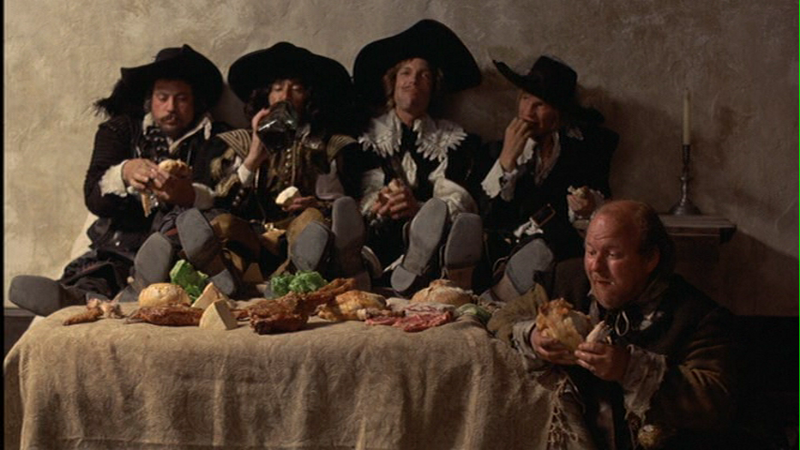 The Four Musketeers deserves a piece of its own, especially for Ollie Reed. No, I don’t think it’s a rosary. 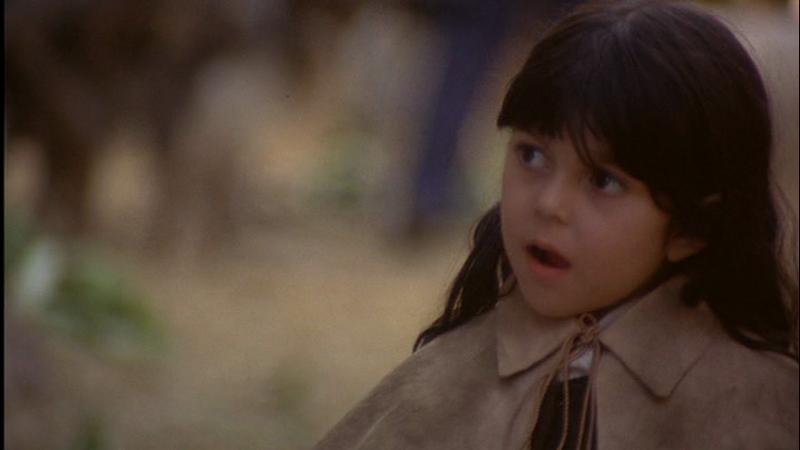 I remember Faye purring to Raquel, in her evil but mellifluous tones: “You must look your best for D’Artagnan!” Then she puts the necklace around her throat and pulls it tight…no, I can’t go on, the scene still gives me goosebumps! Wooden necklace with a big crucifix on the end. I’m no expert — maybe it’s not a rosary, but it’s a big chunky religious necklace. Good enough for me. I was subjected to — admittedly I could have closed my eyes — the PWSA Musketeers on a recent flight. What godawful stuff, with the exception of a handful of interior shots. I’ve read decent defenses of PWSA on the grounds that his work shows some stylistic value, and is practically classical in the filming of action. Which is fine, but I still think the content is junk. 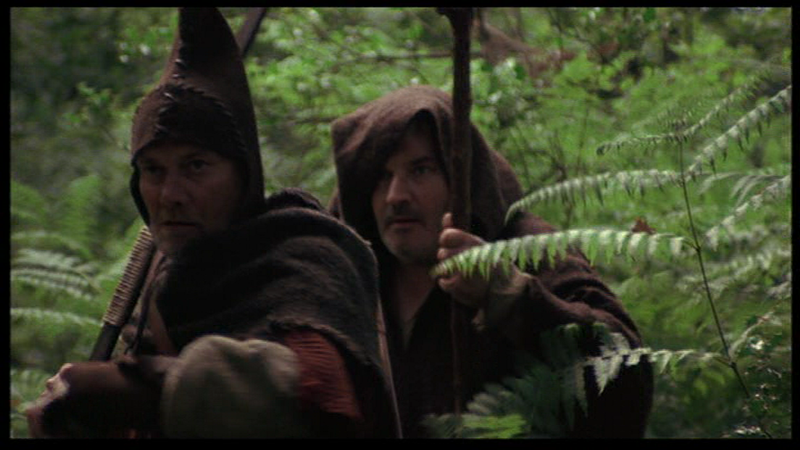 Of course filmmakers will keep doing versions of The Musketeers, but I think Lester nailed it. The only alternative of value I can envisage is a big French production, in French, with an all-star cast and a strong action director with a sense of humour. Twenty years ago Depardieu would have made a great Porthos. I’ve read some of the same defenses, and had them in mind when the film popped up on the plane, but my overall reaction is the same as you; I do think that the sword-fighting sequences were quite crisp and clear, but that doesn’t make up for the ridiculousness of the rest. Changing the core intrigue was especially dumb. I don’t think there’s ever been a French version to touch the Lester film, which is a pity. Depardieu was clearly channeling the Dumas spirit in Cyrano, one of the things that gives that film some of its wonderful energy. And he had William Hobbs, Lester’s fight arranger, on hand. Although the big fight with a hundred men was disappointingly reduced to a bunch of blurry lap dissolves. Still, hard to see how that piece of poetic hyperbole could have been rendered convincingly. Also concerning Depardieu playing Porthos I guess you have seen the 1998 THE MAN IN THE IRON MASK? Though a pretty tepid film I did find the casting of Irons as Aramis, Malkovich as Athos, Depardieu as Porthos and Byrne as D’ Artagnan rather interesting! And speaking of Porthos casting – one of the main questions I would ask Mr. Lester if I ever had the chance to meet him would be why Finlay for Porthos?!?? Don’t get me wrong though since I absolutely love him as Porthos, but boy, physically he was nowhere near the Dumas description of him so I always was curious about his casting! I recall a discussion of Porthos where the logic given was “Finlay isn’t a giant like the character, so he’ll just have to play him in a gigantic manner,” which he did! And he also plays the Duke of Buckingham’s jeweler because the actor cast didn’t turn up that day. I’ve never seen the Schlesinger, and I should. The costumes in Musketeers are stunning, of course. The musketeers’ costumes and wigs were never washed, because they wouldn’t have been, top the point where the actors couldn’t bear to put them on, but none of that showed onscreen, to Lester’s disappointment. Patrice Chereau was actually planning an all-star French epic of LES TROIS MOUSQUETAIRES, but switched to LA REINE MARGOT when he heard about the 1993 Kiefer Sutherland atrocity. So the world was deprived of Chereau’s vision in favour of Stephen Herek’s. You really couldn’t make it up! Chereau’s could have been rather good. But we got La Reine Margot, with Asia Argento and her poisoned lipstick, so it’s not a total loss. 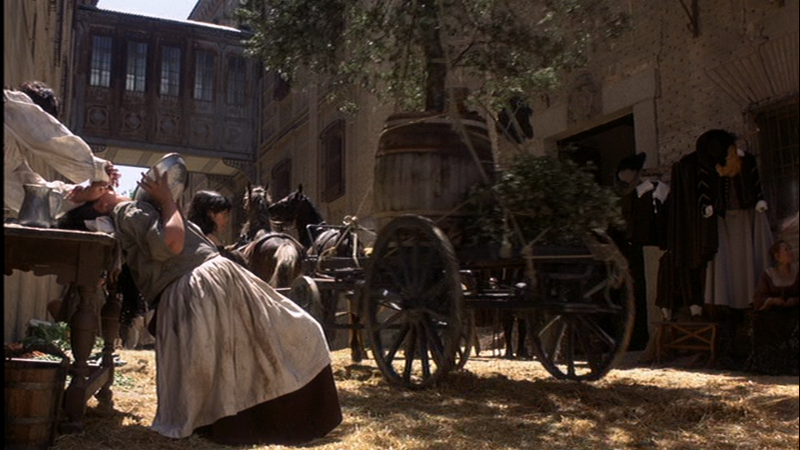 In how many films since LA REINE MARGOT have I felt tempted to poison Asia Argento’s lipstick? Certainly THE LAST MISTRESS is a prime contender…and I’m sure many of her daddy’s movies qualify as well. Never made my way through The Last Mistress, though I tried once or twice. Glad to see that I’m not the only one who didn’t like it. The kind of detailing that you’re speaking of reminds me of what Joshua Logan related to us in a class I took with him back in the day about John Truscott’s design work for Camelot. He told us that Truscott designed the whole thing down to the type of flowers in the country bride’s bouquet in a “ride by” of a church ll language of the flowers, ya know. And the big wedding scene was never planned for the original scene breakdown, but after John presented Logan with that wedding dress, finished, embroidered with over 7000 dried pumpkin seeds…well, he put a wedding scene in, and improvised a set with all those candles. Can’t see much more of it, because there wasn’t much. Great story. 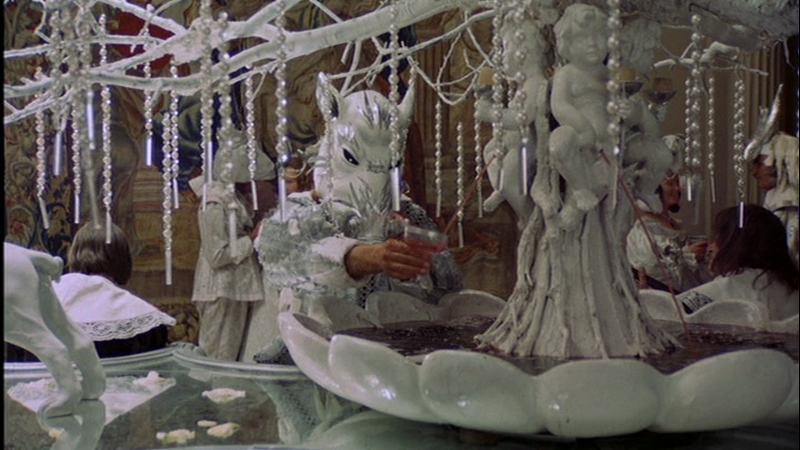 It’s wonderful how a lavish centrepiece can take the viewer’s eyes of everything that isn’t there. Musketeers designer Brian Eatwell built a hospital ward for The Final Programme that’s just a row of beds, a door and a neon sign, surrounded by black. The eye paints in the rest. One of my favourite Lester overdubs takes place with Faye Dunaway’s sedan-carrying dwarfs taking a break at the King’s party. Great point about Lester’s use of extras. His wisecracking New Yorkers hanging on the fringes of Superman’s epic battles is another example. But perhaps the best use is in Cuba. As Sean Connery and Brooke Adams make their long-awaited reconnection in a romantic stroll along a beach, they are oblivous to the ragged children who play with bottles in the mud. I wonder if this was a subtle socialist message to go with his obvious sympathies for the rebels in that film — our exalted heros play out their lives against the miseries of the masses. There’s also a sedan-chair dwarf line “Oof, she’s put on weight” which (1) Dunaway wouldn’t have thanked Lester for and (2) CANNOT be true. And yes, the Cuba scene is undoubtedly a comment on the nature of enjoying yourself in the third world. Beautiful. I’ve read plenty of positive reviews of Lester’s Musketeers films (the first two not the unfortunate and tragic third) but I’ve never, never read an appreciation like this. Bravo. I’ve watched them many times and obviously one can’t fail to note Lester’s use of background sound, overdubs, and asides (present in various of his other movies but never better than here) yet this is the only article I’ve read that picks up on this and really digs in. As much as Lester sometimes slightly overeggs things and creates a slapsticky pudding, there are countless times in these films when the smallest off-to-the-side audio addition or bit of choreography fleshes out the world or enhances the comic mood. There’s something vaguely similar about the approach in Monty Python and the Holy Grail or Time Bandits but Lester brings *more* (though this is occasionally pushed too far). I think it’s particularly telling that these asides aren’t always there simply for comic effect or *not just for that* they tell us something about the times and the people. We have absurd things that looked at from another angle are tragic. The way that the films descend from the light heights of bumpkinish D’Artagnan arriving to seek his destiny at the beginning of The Three Musketeers to the melancholy of The Four Musketeers’ end is pretty masterly. Lester maintains the humour but it becomes increasingly desperate, the deaths in the early going don’t affect us which isn’t the case in T4M as the stakes rise and the danger *cuts*. The absurdity is merely *there* like life but in the second film D’Artagnan gains maturity in the most horrible way and it’s impressive how what was once really slapstick action really hurts as the films progress. Faye Dunaway’s shark-eyed Milady de Winter was scary enough in The Three Musketeers but in the sequel she’s like some kind of demon, one can’t help sympathizing with her for the awful events that turned her into what she is yet what she does is disturbing. And Lester (and George MacDonald Fraser) does it all *right* which is an accomplishmen, whenever anyone attempts to adapt Musketeers again I find myself wondering why they bother. Are they going to be able to equal a gorgeous slapstick Raquel Welch becoming a tragic victim, Ollie Reed as a brooding self-loathing engine of destruction Athos, a truly despicable Chuck Heston Richelieu, an amusing but awful eye-patched Christopher Lee, unexpected historical accuracy, pratfalls and tragedy, etc? No? Don’t bother. It’s like someone trying to remake The Private Life of Sherlock Holmes. Inadvisable. Um, sorry to rabbit on in extemporizing fashion! If you want to find yourself spluttering like Erskine Sanford, read contemporary reviews of the films, particularly the UK film magazines. After uniformly underrating the first film, they all go on to say that part 2 “isn’t as funny.” Admittedly, watching one film in two halves a year apart, as the critics had to, isn’t an ideal way to experience its architecture, but don’t we expect the professionals to be good at reading a film’s intended tone? Better than average? The Monthly Film Bulletin says “and Faye Dunaway disappears from the picture altogether” which suggests the reviewer lost consciousness at a crucial point. They went on to knock the rest of Lester’s seventies output for not being as good as M3, even though they hadn’t liked it. …I swear, I am getting pretty upset on how it appears that Richard Lester’s place in cinema history is being so underrated & way overlooked!!! Where is the love (other than here!)?!? ?